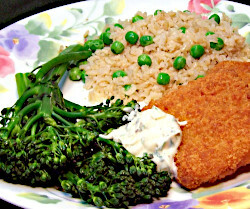 Make a creamy sauce and serve with frozen breaded fish patties, broccolette and a side dish of instant rice and frozen peas. Turn oven on to 400 degrees. Place breaded fish squares on a cookie sheet and put in oven. When fish has cooked for 10 minutes, turn. Start rice. Heat water in a saucepan on high heat until boiling. Stir in rice, reduce heat to lowest setting and cover. When rice has cooked for 5 minutes, turn fish again and start broccolette. Place broccolette in a saucepan and add enough water to cover the bottom of the pan. 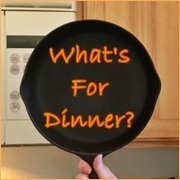 Place a lid over the pan and heat on medium until the water begins to steam (about 1 minute). Turn heat to lowest setting and keep pan covered. Add peas and margarine to rice. Make the sauce. Mix mayonnaise and lemon juice together in a bowl. Finely chop herbs and mix into mayonnaise along with pepper. When rice has absorbed all the liquid and the broccolette is tender-crisp, serve with fish patties and sauce.